John Mellencamp Community > MELLENCAMP.COM ANNOUNCEMENTS > Announcements & Updates > "I Saw Mommy Kissing Santa Claus" - Merry Christmas And Happy New Year Everyone! "I Saw Mommy Kissing Santa Claus" from the A Very Special Christmas benefit album. The video was filmed at soundcheck during the 1987 Lonesome Jubilee tour. Re: "I Saw Mommy Kissing Santa Claus" - Merry Christmas And Happy New Year Everyone! Man I love this song. I love JCM!! When this came out - I was always blasting JCM on my turntable at home, which was above a popular Paterson NJ deli. Totally Jersey this place. The owner, my landlord, he was a charachter. He was always calling into the sports shows and getting on air, live from his deli, cuz he was funny as hell. This guy would stop me as I left my apartment and say "yo donna, you like Mellencamp dont you? You play him all the time.. aye oh" He would bust my chops on this subject many times. But it was all good - he was bustin. However, every Christmas I hear "I saw mommy kissing santa claus" and I think of the fun, young, chillaxin, simpler times ... with cool people just trying to live another day.. and that kindof stuff is one in the same with JCM.. Nothin like a Jersey Landlord who thinks hes a comic, just lovin some John Mellencamp. 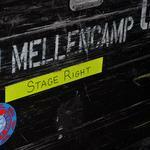 "Was a dark stormy night, as the train rattled on, all the passengers had gone to bed"
I love you John Mellencamp! !